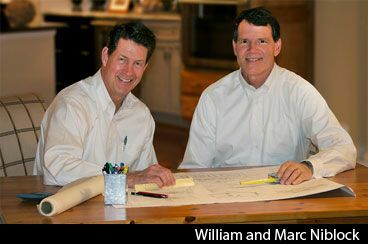 In 1979, three brothers with a passion for excellence, assembled a small home-building company poised to meet the demands of a growing Charlotte area. Back in 1979, Charlotte was just beginning to transform itself into the world class city it is today. Three brothers with a passion for excellence assembled a small home-building company poised to meet the demands of our growing region. Guided by one important principle – doing business with a sense of stewardship and respect – they strived to create an atmosphere of trust so they would always be proud to put their name on every home they built. Fast forward 40 years and 3,500 homes later, we’re proud to say we continue to foster that trust and have built our legacy on it. We view each home as an opportunity to improve the Charlotte neighborhoods and communities in which we live. Niblock Homes started out as a custom home builder. From day one, we have catered to our customers’ wants and needs and have continuously refined our home plans and processes. We focus on the future of the Charlotte region by designing homes to address the lifestyles of today’s active families. Our proud heritage is built on a simple formula: Competence, Communication and Commitment. Niblock’s culture is based on the principle of individual excellence. Our team has been built to work as one, with accountability guiding each individual task. Home Buyers Warranty awarded us the coveted Diamond Builder award for consistently providing quality, customer satisfaction and innovation. No corner cutting, no empty promises, no exceptions. No relationship can survive without it. Trust is only possible with good communication. All elements of the home building process are carefully executed and openly reported. A personal Niblock representative – a central, highly trained and knowledgeable source for all communication – guides you through the entire experience. This ensures all milestones are met and your home is delivered just as you requested. Period. Quality isn’t just a word to us. Without reservation, we openly promise to source, construct and stand behind all the materials and workmanship that go into every home we build. We believe in the importance of providing EPA Energy Star homes to ensure they are energy efficient, healthy and comfortable. As recipient of the prestigious Diamond Builder Award, you’ll find quality design concepts in every home we build. Discover all that awaits you in the exciting Charlotte, NC area in our move-in ready homes, where elegance comes standard. Bring us your custom plan and our experts will bring it to life. Or choose from our vast selection of floor plans and home styles, and let our designers work with you to customize that plan to suit your family’s individual needs and tastes. Niblock Homes delivers beautifully crafted homes in eleven communities in the greater Charlotte, NC region and gives you freedom to choose customizable design options that reflect your design style. Explore these communities and the options for your next new home.